Each year, 1 out of 4 adults age 65 and older will experience a fall. It is common for the body to go through physiological changes as you age. Muscles lose mass and elasticity which leads to a loss of strength and range of motion. Stiffness increases as healthy muscle is replaced by tough fibrous tissue, making it difficult to move thus inhibiting balance. Bone density is lost, compromising the integrity and structure of joints making movement unstable and fractures much more likely. 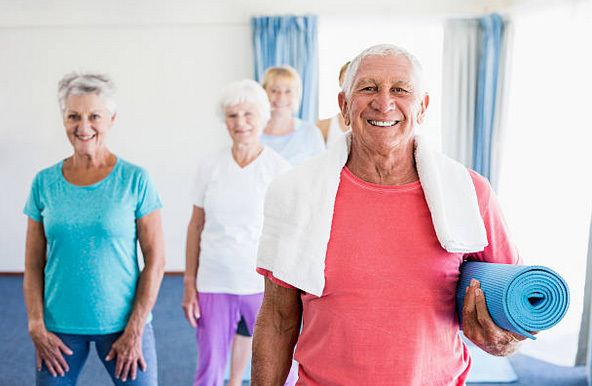 This combination of muscle loss, bone weakness, and unstable balance creates a dangerous situation for adults as they age. Every second in the United States an older adult will experience a fall, making it the leading cause of injury/injury-related death for older Americans. The good news is that falling is not an inevitable outcome for aging adults. Aging is a natural process and it is not something that should be feared. Practicing evidence-based programs that increase strength and challenge your balance can greatly reduce the risk of falling. There are two separate categories of activities that enhance balance and therefore prevent falls: static balance and dynamic balance. Static balance is when you remain stable and fixed in a particular position. For example, standing in tree pose or on one leg for a period of time will increase your static balance. Dynamic balance is remaining steady while going through a series of movements. This includes walking, climbing stairs, or stepping over objects. These activities are facilitated by core muscle strength, postural alignment and joint mobility. Yoga is a scientifically-supported activity that works to enhance balance through these three things. 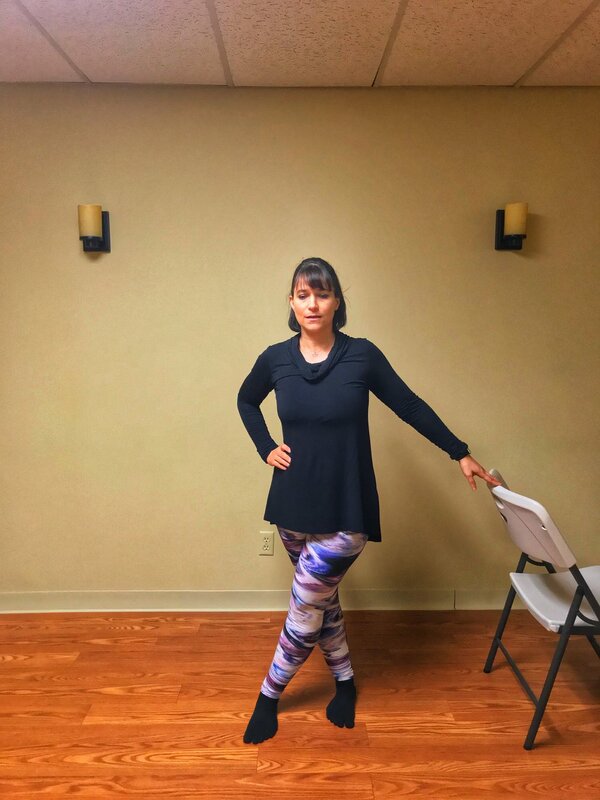 The various poses you do during a typical yoga class cohesively work to not only increase your muscle strength, but improve flexibility and posture allowing for better balance and mobility. Yoga is an exceptional activity for older adults because it integrates both static balance exercises and dynamic balance exercises. This six-part Yoga sequence will provide you with poses to help you build muscle strength, improve your flexibility, and enhance your balance. Modifications are always offered so it is perfect for beginners. Practice this flow daily and watch as your balance improves! Stand up straight behind a chair, holding the back of it with both hands. Position your feet hip-width apart and evenly distribute your weight on both feet. Lift your heels off the floor, shifting your weight to the balls of your feet. Try to balance evenly without allowing your ankles to roll inward or outward. Hold. Lower your heels to the floor, maintaining good posture as you do. To make this pose harder, extend your arms upright as you lift your heels. To make this pose easier, sit down in a chair and life your heels off the floor, hold, then lower your heels to the floor. Repeat. Sit back as if sitting in a chair. Use a chair in front of you to remain stable or if your balance is shaky. Your feet should be flat on the floor, hip width apart, and directly beneath your knees. Lean forward slightly and slowly stand up. Maintain control during movement. Press your heels into the floor and tighten your buttocks as you stand to help you balance. Exhale as you stand, inhale as you sit back. Repeat 10 times. As you build your strength and balance, increase to 2 or 3 sets. Always make sure you are maintaining control and moving slowly. Stand tall behind a chair with your feet apart slightly. Place your left hand on the back of the chair and relax your right arm at your side. As you inhale, step back with your left foot, with your heel off the floor. Bend your right knee, lowering into a lunge and raising your left arm overhead. Hold. Inhale as your bring your feet together and exhale as your lower your arm. Repeat on the opposite side. 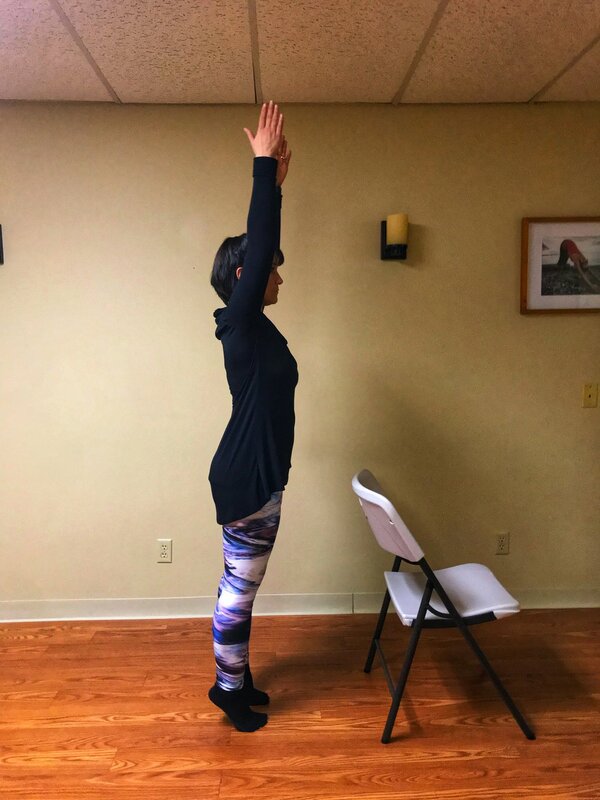 As you become stronger and more flexible, you can try this pose without a chair, raising both arms overhead. Keep the movement slow and controlled and make sure to keep your front knee over your ankle. Tighten your abdominal muscles to support your back. Lift your arms out to each side at shoulder level. Step forward several inches with your right foot, then slide your left foot forward to the heal of your right foot. Step forward again with your right foot, then slide your left foot forward. Step backward several inches with your left foot, then slide your right foot backwards to the toes of your left foot. Maintain neutral posture and brace your abdominal muscles throughout the movement. As you bring your feet together, squeeze your inner thighs together to help you balance. Stand up straight, feet together and weight evenly distributed on both feet. Put your arms at your sides. Step toward the right with your right foot. Cross in front with your left foot, step out again with the right foot, and cross behind with your left foot. Continue this braiding for 10 steps to the right, then bring your feet together. Hold until steady. Now do 10 steps of braiding to the left side of the room. Use a chair if you need balance. Stand tall with your feet together and touching. Relax your arms at your sides with your shoulders back and down. As you inhale, raise your right heel off the floor, so only your right toes are touching it, and turn your leg outward. Repeat on the opposite left and use the chair for balance. You can increase the challenge of this pose by either raising your right leg higher on your left leg, being mindful not to put pressure on the knee or by bringing your palms together in front of your chest. Along with practicing these poses, it is also recommended to take preventative measures within your environment to decrease the risk of falling. Eliminating clutter, providing adequate lighting, tucking away electrical cords, and making sure all carpets and rugs lie flat are all parts of the home safety checklist you should do annually. Below is a specific checklist organized room-by-room to help you recognize and avoid hazards. Print this list, share it with friends, and review it periodically checking each off to remind yourself which have been completed. ☐ Keep a phone and lamp close to your bed. This will make it easy to navigate late at night and provide you with comfort if you need to contact someone. ☐ Make sure your bed is low enough so you can put your feet flat on the floor when getting up. ☐ Arrange furniture so you have a clear path to the door. ☐ Store often-used items in easily accessible areas. ☐ Keep a stool handy to reach items in high cabinets. Always make sure you have balance. ☐ Keep entrances and walkways free of clutter, uneven surfaces, holes, or cracks. ☐ Make sure steps are sturdy. ☐ Make sure doormats lie flat. ☐ Install bars and non-slip mats in the bathtub or shower. ☐ Install a low-threshold shower or walk-in tub if it becomes difficult to step in and out of. ☐ Always make sure the floor remains dry to avoid slips. ☐ Make sure light switches are at the bottom and top of stairwell. ☐ Keeps stairs free of clutter and in good condition. ☐ Keep floors free from clutter. ☐ Tuck away electrical cords. ☐ Provide adequate lighting throughout house. ☐ Have emergency numbers available at all times. This checklist, along with the workout provided above are great tools to avoid falls and maintain your health and safety. 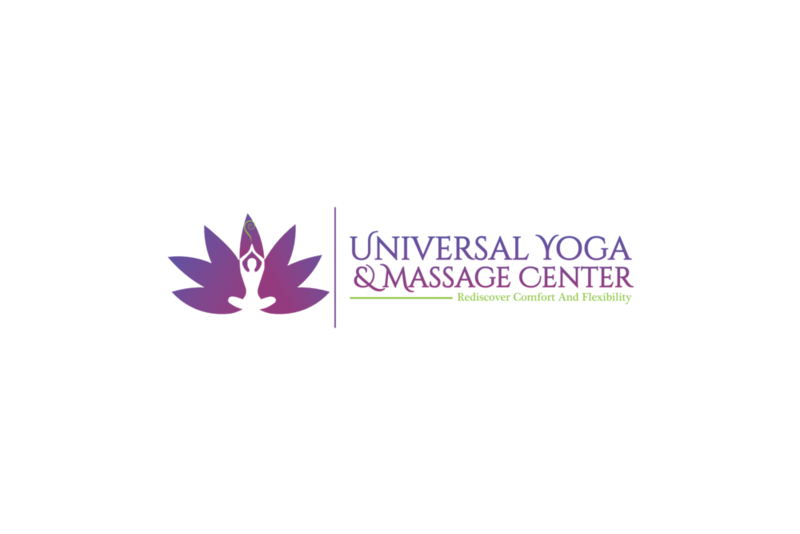 At Universal Yoga and Massage Center we offer yoga classes for everybody! Come try our Senior Yoga classes on Tuesdays and Thursdays at 11:00AM or our Chair Yoga classes on Mondays or Wednesdays at 11:00AM. Share this article with family, friends, and loved ones to educate on the importance of prevention.